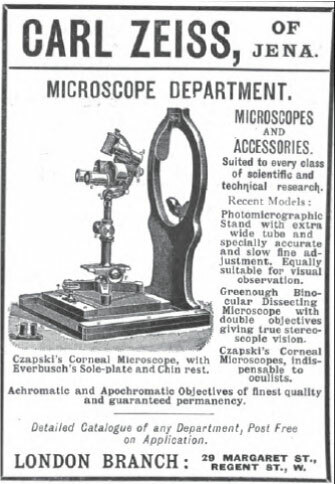 What scientists in 1903 wanted for Christmas! For most scientists, the arrival of new equipment can feel a lot like getting toys on Christmas day. There’s the excitement of opening the package, the giddy thrill of discovery of what the equipment can do, followed by an almost frenzied period of time playing with it and figuring out how it works. These days, I’m a theoretical physicist, so my thrills are limited to books, computers and software, but it is still a great feeling when new stuff arrives for me to work with. 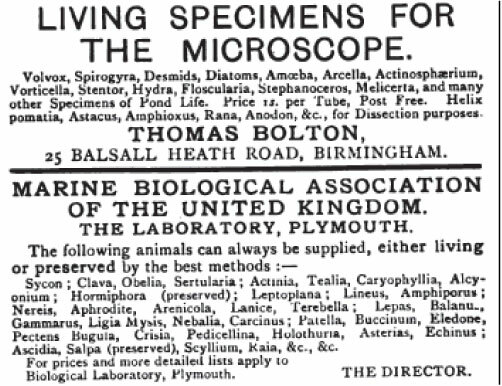 Recently, while I was looking for a paper published in Nature in 1903, I happened across a series of advertisements in a supplementary issue of the magazine. These ads, clearly targeted towards those of a scientific persuasion, immediately fascinated me. 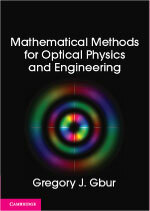 They provide a unique snapshot of not only the science of the time, but also the business of science at the time. They illustrate what scientific discoveries were new and “hot” in the community, what kinds of equipment were popular enough to become commercial products, and what sort of jobs and services were available. 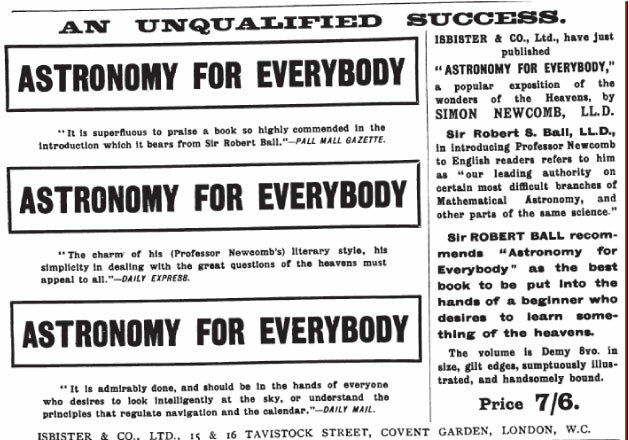 I thought I’d provide a survey of these advertisements, which probably are a good indication of what scientists at the beginning of the 20th century were hoping to find under the tree at Christmas! Guglielmo Marconi (1874-1937) is famous as the popularizer and commercial developer of wireless telegraphy, the precursor of modern radio. In 1886 Heinrich Hertz performed the first demonstration of electromagnetic (radio) waves, raising the very real possibility of radio communication. The experiments of Hertz and other scientists caught the attention of Marconi, who began his own investigations around 1894. By 1896, he had developed a system that could transmit over 1.5 km, and he traveled to London to garner financial support for his project. His work attracted much attention, both from the scientific community and the greater public, and he was able to extend the capabilities of his devices dramatically. In December 1902, the first radio broadcast from North America to the United Kingdom was achieved, and in early 1903 a message was sent from President Theodore Roosevelt to King Edward VII. Clearly by mid-1903 Marconi was firmly established as a pioneer in wireless communication; in 1909 he would share the Nobel Prize in Physics with Karl Ferdinand Braun “in recognition of their contributions to the development of wireless telegraphy”. Marconi’s achievements did not come without controversy, however. His devices relied heavily on electrical components developed by others, and controversy over who really made the important contributions to the development of wireless telegraphy led to numerous patent challenges. Carl Zeiss (1816-1888) was a German lensmaker who founded an optical instrument company in 1846 in the city of Jena. He became a leading maker of microscopes, and in 1866 he joined with physicist Ernst Abbe and discovered an important lens criterion known as the Abbe sine condition. The Carl Zeiss company is still operating today, now known as Carl Zeiss AG. It is interesting to note that the company was split into two when Germany was divided after World War II, and eventually reunited with the fall of the Berlin Wall. By 1903, the company Carl Zeiss, Jena was a worldwide optics company. The instrument pictured in the advertisement is one that is familiar to anyone who has visited an opthamologist; note the chin rest! Simon Newcomb (1835-1909) was a Canadian-born astronomer who was very accomplished during his lifetime. Among his scientific achievements, he collaborated with Albert Michelson on speed of light calculations, although his own methods were quickly eclipsed by Michelson’s simpler ones. Newcomb was also the first person to discover what is now known as Benford’s law, a law that suggests that, in many data sets, the leading digits of the data are distributed in a regular and non-uniform way. Newcomb observed this phenomenon when he noted that certain pages of logarithm tables were more worn than others. The present work grew out of articles contributed to McClure’s Magazine a few years since on the Unsolved Problems of Astronomy, Total Eclipses of the Sun, and other subjects. The interest shown in these articles suggested an exposition of the main facts of astronomy in the same style. The result of the attempt is now submitted to the courteous consideration of the reader. The writer who attempts to set forth the facts of astronomy without any use of technical language finds himself in the dilemma of being obliged either to convey only a very imperfect idea of the subject, or to enter upon explanations of force and motion which his reader nuiy find tedious. In grappling with this difficulty the author has followed a middle course, trying to present the subject in such a way as to be intelligible and interesting to every reader, and entering into technical explanations only when necessary to the clear understanding of such matters as the measure of time, the changes of the seasons, the varying positions of the constellations, and the aspects of the planets. It is hoped that the reader who does not wish to master these subjects will find enough to interest him in the descriptions and illustrations of celestial scenery to which the bulk of the work is devoted. Newcomb was a varied and prolific author, penning books on economics as well as astronomy, and even a science fiction novel, His Wisdom the Defender (1900), which I will have to read and review on the blog in the near future. The Atwood machine is a venerable demonstration device first invented in 1784 by the Reverend George Atwood (1745-1847) to demonstrate Newton’s laws and the effects of uniform acceleration upon a body. To save space, the advertisement shows the machine horizontal, though its proper orientation is vertical. With very similar, but not equal, weights attached to either end of the string attached to the pulley, the heavier weight will accelerate downward slowly, and its progress can be timed and measured. Atwood machines are still used as lecture and mathematical examples to this day; an Atwood machine even played a role in a fictional murder mystery written by M.P. Shiel! The spinthariscope was invented by William Crookes in 1903 as a device to observe the then relatively new phenomenon of radioactivity. (I discussed the basic history of radioactivity in a recent post.) In 1902, Marie Curie had discovered that ores of radioactive uranium contained a new element a million times more radioactive, named “radium” for this property. Radium appeared almost as a magical substance at first, seeming to violate laws of conservation of energy and thermodynamics. Crookes was one of many who was studying the properties of radium, observing the near continuous glow it imparted on a fluorescent screen, when he spilled some of the radium onto the screen. Searching for the spill with a microscope lens, he noticed pinpoint flashes of individual decays illuminating the screen. He took this observation and turned it into a self-contained demonstration device, consisting of a lens, an internal screen, and a small radium sample. One can look inside and see the intermittent flashes of radioactive particles, a sort of “nuclear kaleidoscope”! The advertisement shown above is likely one of the first ones made for the device. This X-ray apparatus, designed by Harry Cox, Ltd.*, is designed and advertised as a portable unit that can be brought to the bedside of patients. In the center of the image one can see the X-ray tube, likely a Crookes tube, that is the source of the radiation. It is unclear whether the system included the actual photographic plates for producing images, but the testimonial that it includes the “entire outfit” suggests that this is the case. 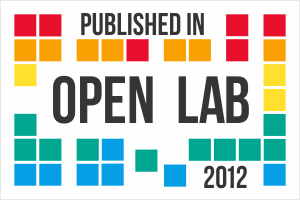 Those who have scanned scientific job postings will see that the ads are not much different. 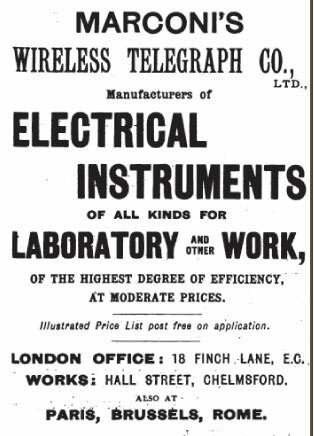 It is somewhat striking, however, to see advertisements of workers applying for jobs: “Skilled mechanic requires situation as laboratory assistant.” The type-writing services are also something no longer commonly encountered, as most researchers now typeset their own manuscripts. Hughes’ Photo-Rotoscope Peep Show. The greatest money-taker of the 19th century; animated pictures in the open daylight at Seaside, Bazaars, &c. Measures 9 feet long. Twenty people can see at one time. Not a toy, but high-class. Price, complete with Photo-Rotoscope machine, £21 10s. 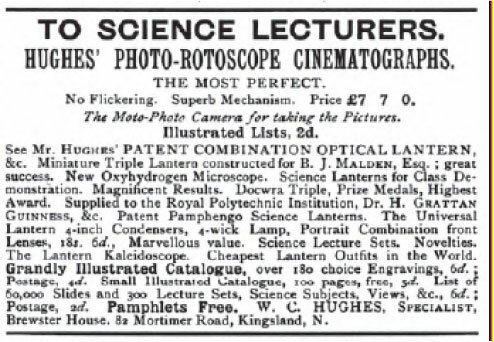 I find it rather striking that even in this early era, movie-makers realized that their projection equipment could find a market in education, particularly science education. Hopefully these advertisements give a different perspective on how exciting it was to be a scientist at the beginning of the 20th century! There are plenty of other intriguing ads to be seen just in the issue I perused; those interested can read the pdf at this link. I should note one other somewhat amusing ad. In 1893, a new physics journal was founded, though by 1903 it still could hardly compete with the giants such as Nature, the Philosophical Magazine and the Philosophical Transactions of the Royal Society. What better way to get some additional attention than advertising in one of these? * I hope everyone will appreciate how hard it was for me to resist making a joke at the expense of this company’s name. And, yes, I am 4 years old. 6 Responses to What scientists in 1903 wanted for Christmas! 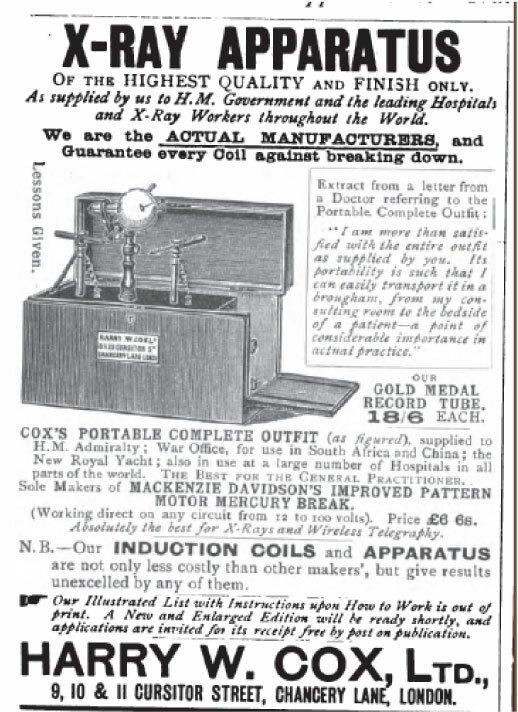 One of the ads is chilling in retrospect — it’s terrifying to consider what radiation damage the (probably) unshielded Cox X-ray device must have wrought on doctors using it. It reminds me of how they used to use X-rays to measure foot size in shoe stores: http://en.wikipedia.org/wiki/Shoe-fitting_fluoroscope. It’s fair to say that the turn of the century was not just an exciting time for scientists, but a dangerous one as well. Folks were completely ignorant of the dangers of X-rays and radiation and happily did all sorts of harmful things with them. I noted on twitter that Frederick Soddy, a chemist, actually advocated ingestion of radium to cure tuberculosis! In later years, woman painting glow in the dark radium watch hands would become sickened, leading to a major lawsuit. The Curies, of course, met an awful end, as did an assistant of Thomas Edison, Clarence Madison Dally, who suffered fatal radiation poisoning from his experiments and died in 1904. You shouldn’t be surprised that movie makers were aiming at the educational market. 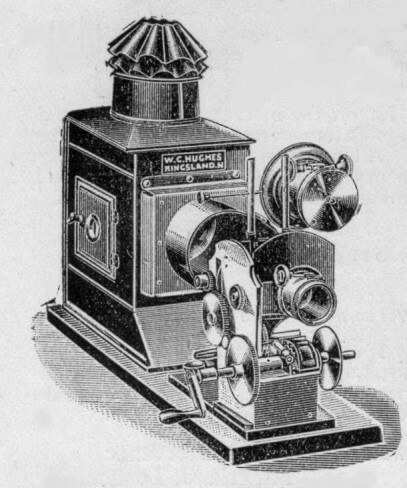 The magic lantern slide projector had been around for decades, and by the late 19th century, as I remember from the reprinted Sears Roebuck catalog, there were lots of educational slides with animals, microbes, mining, industry, history, famous people and places and so on. There were even a few slides with moving components to show how the phases of the moon and orbits of the planets worked. When movies came out, the educational market was a no brainer. Fair enough; I personally found it fascinating how quickly they came around to adapting the new tech.